Before Greenville-Spartanburg International Airport (GSP) broke ground on a $115 million terminal expansion and improvement program, it asked the community for input. While no surprises emerged from the focus groups they held, a common theme did: Community members really liked their airport. “We heard a lot of people say that this airport is a simple airport to fly out of: Don’t mess that up,” says Kevin Howell, GSP vice president/COO. Currently, GSP serves 1.8 million passengers a year out of a 226,000-square foot terminal built 51 years ago. Though renovated and expanded in the late 1980s, the aging terminal, sporting 13 departure gates, needed freshening up in order to continue enticing passengers to fly out of it instead of its larger counterparts; Charlotte-Douglas International Airport, 85 miles to the north; and Hartsfield-Jackson International Airport, -165 miles to the south. “We leak a lot of passengers to those airports,” Howell admits. In order to compete, he says GSP needs to sell an exceptional passenger. “We need to be that be-all-to-end-all airport because at the end of the day a passenger doesn’t have a lot of choice as to which hubs they connect to, but they do have a choice about where they originate or end their trip,” he explains. GSP developed a blueprint for its future dubbed WINGSPAN, a $115 million improvement program designed to propel the aviation center toward the years ahead. It is hoped that WINGSPAN, 80 percent of which is being paid for by airport funds with the rest of the tab being picked up by the FAA and TSA, will increase capacity, improve efficiency, incorporate state-of-the art safety processes, integrate sustainable practices, positively impact the area’s economic landscape, and become theairport of choice for Upstate residents. But you can’t accomplish any of these goals with a terminal designed for another time, Howell emphasizes. The airport plans to execute the 48-month project in three key phases. Phase I is ongoing and has moved the rental car customer care center, is updating Concourse A and B restrooms and concessions; constructing a North Wing to temporarily relocate airline facilities and move utility infrastructure. 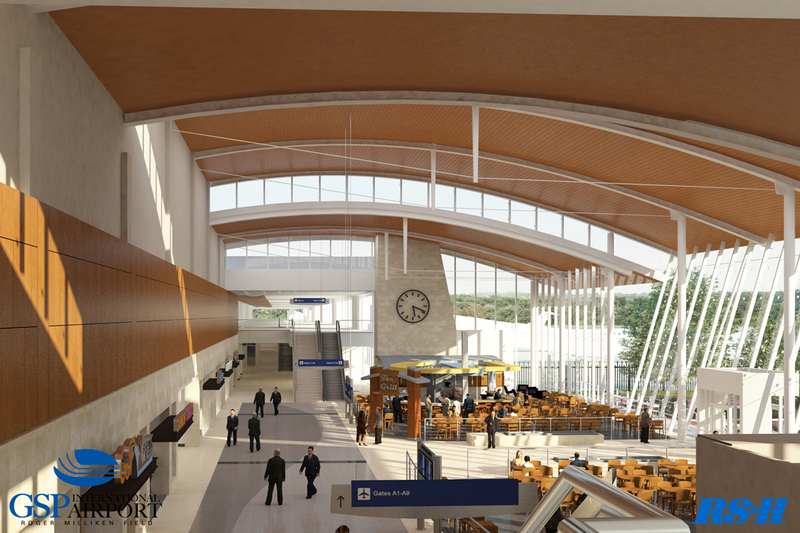 Crews recently began the second part of Phase I, which includes installing new baggage carousals, adding canopies over passenger loading/unloading areas, constructing a covered walkway to Garage A and B, and installing new glass on the terminal front. Once this work concludes in March, crews will begin Phase II construction, which includes adding a new food, beverage and retail concessions area in the Grand Hall; renovating the existing ticketing lobby; creating new customer service booths; adding a landside garden; installing baggage screening equipment and facilities; consolidating security areas; and -renovating Concourse A and B. Later, Phase III will add administrative offices and a conference center. Howell expects the project to be complete by the first quarter of 2016. Airport officials based the entire design on the fact that GSP expects to double its traffic by 2020. They used the design criteria of 2 million enplanements annually; given that the airport is just shy of 1 million enplanements today. But Howell explains, “We’re always looking on the horizon” as he points out that GSP has averaged 5 percent annual growth for the better part of 50 years. A Green Future Long-term sustainability is a key part of WINGSPAN’s renovations, according to Howell. Early on, airport officials met with the design team to discuss LEED accreditation. Though they ultimately decided not to chase after a “plaque on the wall,” Howell says they did incorporate items on the LEED certification checklist. For example, today the front of the terminal is 90 percent concrete and 10 percent glass, but when crews complete renovations, the terminal will be 90 percent glass and 10 percent concrete to take advantage of natural light. The entire exterior wall will be glazed, allowing natural light to filter in, while metal louvers diffuse the light to maintain comfortable lighting and temperatures inside. A high-tech building automation system from Automated Logic of Kennesaw, Ga., will control ambient temperatures while lighting will be adjusted by a system from Hubble Inc., headquartered in Shelton, Conn. According to Robert Postma, vice president/project executive of Aviation, for Skanska USA Building Inc., sensors throughout the building read light levels and as soon as there is enough outdoor light coming into the interior, the system will dim circuits and zones to save energy. “The system is essentially watching the environment and thinking automatically on its own,” he says. The building control system allows technicians to monitor the entire facility from wherever they are. The system even enables them to utilize “free” air conditioning whenever possible by increasing outside air intake to cool the facility. In addition, occupancy sensors throughout the building monitor the space, and adjust temperatures and lighting accordingly when people are not using an area. The facility design also incorporates solar hot water, where the sun’s rays will be harnessed to heat water for hand washing in restrooms and concession areas; and rain water harvesting, where water will be collected for non-potable use. Howell notes that everything included in the design is on the “leading edge but not the bleeding edge” and only those sustainability options with a sufficient return on investment (ROI) made it into the final product. “We wanted to incorporate things that made good business sense, not just things that made us feel good,” he explains. Not only that but the payback had to start immediately; stakeholders didn’t want to add things to the design that would need replacing before there was a return. The paybacks are there, according to Howell. “We’re adding a couple hundred feet to the facility but based on our analysis, we think utility usage will remain neutral,” he says, which is good news for the airport, who committed to its six airlines, that the project would not raise costs per enplanement. Enhance the Experience GSP strives to greatly enhance the passenger experience through these improvements. The new design incorporates a central security checkpoint and moves security services behind the check in area. The design also connects Concourse A to B through the Grand Hall so that passengers no longer have to go through security to move between the two concourses. The consolidated area will also feature four security lanes, but will be built to expand to as many as eight lanes in the future. Exit lanes remain an unknown, but Howell says there will be two lanes and they will not be “staffed with a human being but with technology.” All that remains is for them to decide which technology they plan to use. The new baggage claim area will also improve the passenger experience. The finished area will offer three sloped plate baggage claim carousals, versus the two flat-plate devices currently in use. These installations are covered by a small TSA grant. “The addition of the third baggage claim area adds redundancy,” says Howell, so if there is a delay with one carousel they can utilize the third. The new baggage claim area will also offer concessions, where currently there are none. In addition to new baggage service offices, a ground transportation services counter, and a customer service center, there will be a Hudson retail, coffee and snacks area, which includes Dunkin Donuts and a grill franchise. Canopies over the area outside baggage claim will keep customers out of the elements as they leave the building and head to their cars. “It’s going to be a whole new place with new concessions, new amenities, and new canopies,” he says. New concessionaires and retail outlets will also move in post security; a first for this airport where the bulk of concessions appear before security. “It’s been proven in our industry that concessions perform better for most passengers when they are post security,” Howell says. The new concessions area will incorporate some local flavor including Thomas Creek Grill and RJ Rockers noted South Carolinian-microbreweries; Chick Fil-A; and Green Leaf’s, which features salads and sandwiches. MSE Branded Foods holds the food and beverage contract while Hudson holds the coffee-snacks and retail contracts. “It’s easily a 50 percent increase in concessions offerings,” says Howell. A Long Winding Road The tree-lined drive into the airport, which is actually a 3,500-acre working tree farm, makes one feel as if they’re driving into a country club or a college campus. It’s not the concrete jungle that’s often synonymous with driving into an airport. Gardens in front of the terminal, a fountain and mature trees round out this unique airport experience. Preserving the winding roadway’s beauty and incorporating new quiet spaces designed to give weary travelers a respite on their journeys had to be part of the project, he says. “When we started this project, we said we didn’t want to impact these things, we wanted to make it better—we wanted to bring the outdoor beauty indoors,” he says. The terminal’s glass exterior serves to bring the outside in so that passengers can see the landscape from the front and back of the facility. The new airside food court will include a terrace for people to enjoy a meal before getting on their flights. The landside garden will include benches around the fountain in front, and outdoor seating areas to the north end of the facility. “These areas are designed to give passengers little breaks from the hustle and bustle of the airport,” Howell says. When the public charged GSP officials not to mess up their airport, GSP stakeholders took these words to heart. As a result, the new structure will not only maintain the airport’s claim to fame, but will make it better. Hold focus groups. According to Greenville-Spartanburg International (GSP) Airport Vice President and COO Kevin Howell, do not enter a project without asking the user community what they want in their airport. What do they like? What don’t they like? What would they like to see in the future? Continually look for new offerings for passengers. Keep close tabs on retail trends. Look for things to add—no matter how small—to improve the passenger experience, whether it’s a shoe shine stand or more vending. “Always look for ways to treat the customer the way you would want to be treated and provide the things you would want while traveling,” Howell says. Know what your signature is. The 3,500-acre tree farm along the roadway coming into GSP, and its airside gardens and water features, were important to passengers. As a result, the airport charged engineers and designers to find ways to preserve or improve upon them. Put the bulk of concessions post-security. Howell reminds that retail and concessions perform better post security, noting passengers often want to get to their gates before visiting those areas. Project:WINGPSAN terminal development and restoration Location: Greenville-Spartanburg International Airport Construction Manager: Skanska Moss, a joint venture between Skanska USA Building and local contractor Moss & Associates Program Manager: Jacobs Engineering Architect: Baker, architect for Phases II and III of the project Lead Architect/Engineer: RS&H Building automation system: Automated Logic Lighting System: Hubble Inc.